Last week ended with Valentine's Day. 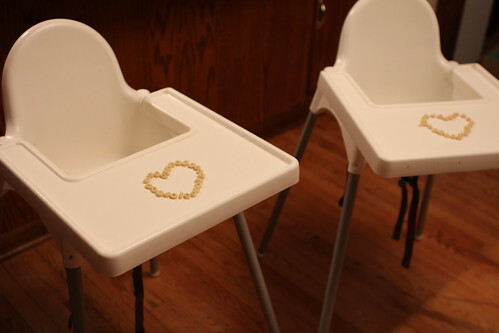 This gave Jen the opportunity to create these beautiful breakfast trays out of Morning O's for the boys. 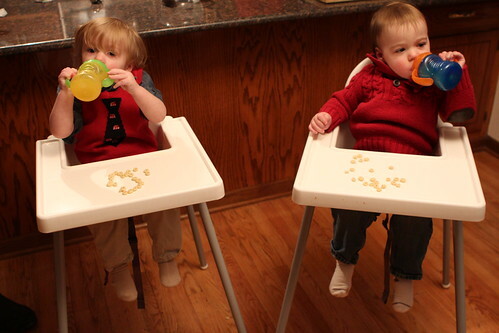 It also gave the boys the opportunity to slouch in their chairs and drink from their sippy cups, unimpressed with her efforts. 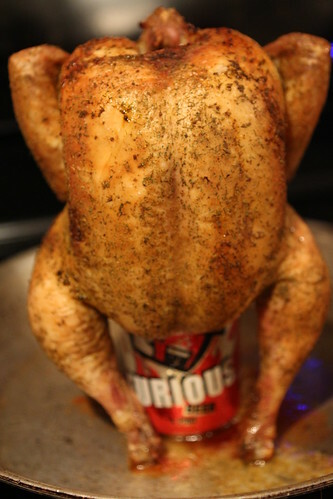 That night I planned an unconventional dinner by making beer can chicken using what may be the finest beer ever used for the dish: Surly Brewing Furious. 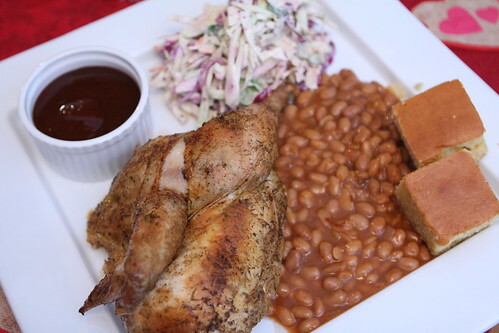 The dinner I created was a replica of what we used to order from Dallas BBQ, the BBQ restaurant near our apartment when we lived in Manhattan. This was an effort to create our first ever Valentine's Day in New York where we ordered take out in a failed attempt to do something more meaningful. We also came across a documentary about Russian mail order brides on cable called In the Name of Love and ended up watching it. While, at the time, we recognized how horrible the day was, it may have been the most memorable Valentine's Day we've ever shared. Jen corrected me later to say that she believes we actually got take out from Coganelli's, the Italian menu at the local Irish pub, Coogan's. I can neither confirm nor deny this. 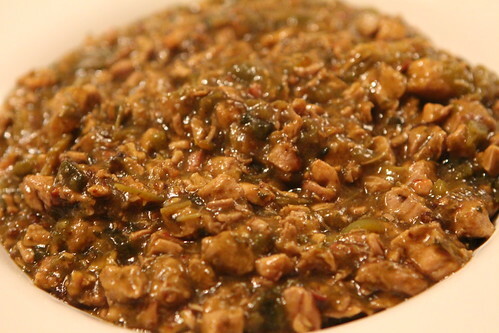 Had I know I would have made some shoddy rotelle with Italian sausage. 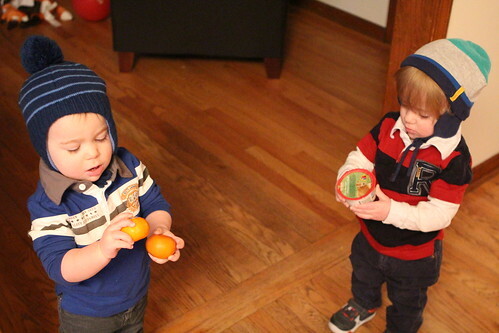 Saturday morning began with a rousing new activity called "The Bag Game." This involves removing all the plastic bags under the counter, packing them into a cardboard box, then stuffing them back under the counter. In the later morning we visited some friends in town who recently had twin sons to give them a haunting glimpse of what their life will be like in a couple of years. Except for that they already have a daughter so it will be like what we showed them but more complicated. Elliott enjoyed the room full of new toys to play with. We returned home and Martin did his best to identify as many animals as possible before their nap. We had to wake them up from their nap so that we could take them out for a much needed haircut. Much needed by Martin, anyway. Elliott just got a show cut. A show cut that cost the same as his brother. Jen told me that there was a place called "Jungle Cuts" in town to take them and asked me to look up directions. 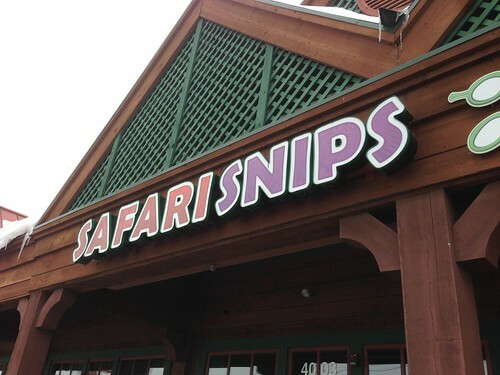 I put "jungle cuts" in Google Maps and this was the first thing that came up. It was an impressive showing of how well-tweaked their algorithms are. I will not show you any pictures of the horrors that took place inside that building. Elliott's haircut lasted about two minutes but Martin's lasted about ten minutes and, for unknown reasons, he was freaking out the entire time. Elliott had a blast playing on the indoor slide, going down all by himself, oblivious to the screams of his brother in the other room. 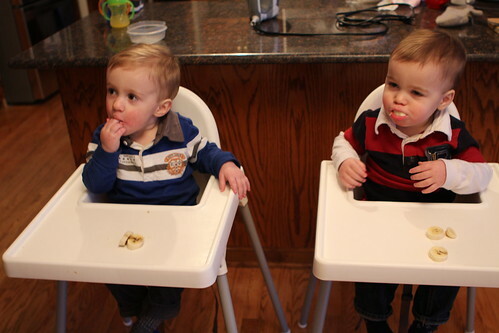 After their haircuts they demanded bananas, which seems to be the only food they have any interest in eating lately. They demand it for breakfast, lunch, and dinner but we only give it to them sometimes as we're pretty sure that there would be some nutrients missing in their diet if it was their only form of sustenance. 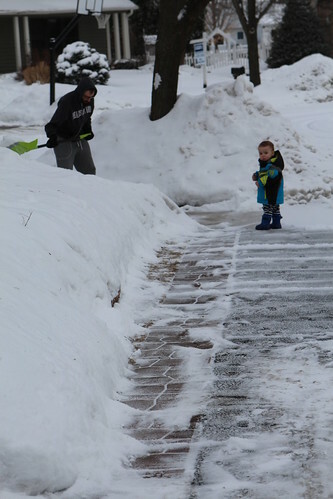 On Sunday, after a slight snowfall, I shoveled (again) in anticipation of a sizable storm the following Monday. 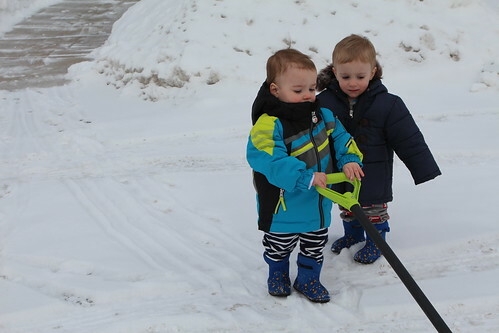 The boys even got out to help by pushing the shovel around. I appreciated the help though I think if they had loadlifters it may have come in a little more handy. 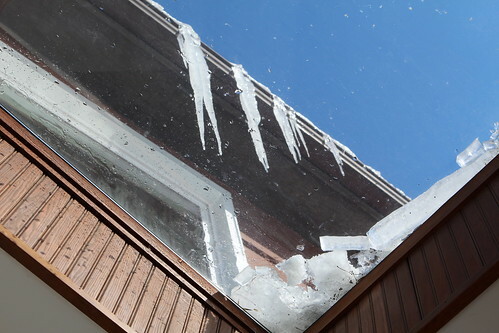 The afternoon and morning on Sunday were spent being occasionally startled by the crashing of icicles falling from the roof onto our skylights. Luckily the glass stayed intact, though I'm not entirely sure how. On Monday, due to a series of emergencies, Evelyn ended up spending the morning with us while Jen worked and I entertained her with blocks, toys, and the Winter Olympics. After a full morning and feeding I put her to bed. Since we didn't have anywhere for her to sleep I put her in the little dog bed that the boys got for Christmas and have yet to play with even though they loved the one at their Grandparents' house. She loved being in the bed though I don't recommend taking pictures of your niece in a dog bed then posting them on a blog that her mother reads. That's sure to be ill advised. We had a moment to skip out for lunch on President's Day as the boys were at day care and the snow began to whip up into Blizzard-like conditions. 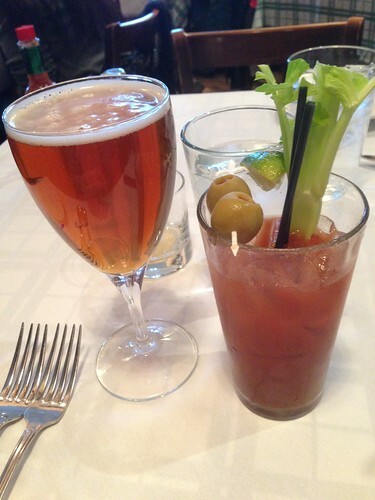 We had a rich lunch, drinks, and watched Olympic hockey at a restaurant downtown. While we felt pretty crappy from a poor night's sleep the night before and the heavy lunch it was totally worth it. Meals without rampaging wombats are few and far between these days. Then it was back home to shovel the six or seven inches of snow that seemed to fall in a matter of just a few hours. After a quick dinner Jen read the boys their bedtime stories and we got them to bed. The bedtime horrors have slowly, but steadily, declined over the last month. Slowly but surely they have required a little less attention and sometimes go to sleep with no fuss at all. It's all about catching them at exactly the right moment and not upsetting the delicate balance. Never upset the delicate balance. The cold continues. Mother Nature is making me pay for all the times I have said how much I enjoy the winter. Jen and I have argued about this for years and, for the first time I can remember, I am longing for spring. We really don't have anywhere else to put any additional snow. However, there is a rumor that temperatures may rise above freezing soon for the first time in over a month. 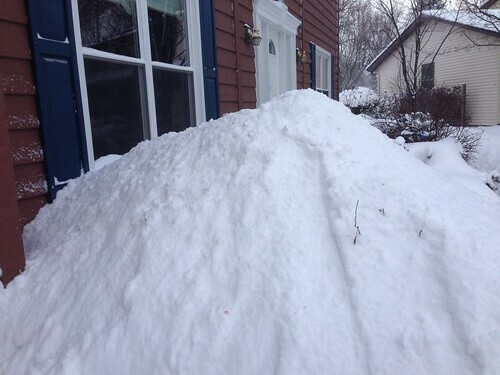 This got me very excited for the prospect that some snow would melt and free up some space for shoveling. Yup, it's official. I'm a dad. Martin has taken his uncle Scott's drumming lessons to heart and is embracing Scott's flare for the percussively dramatic. 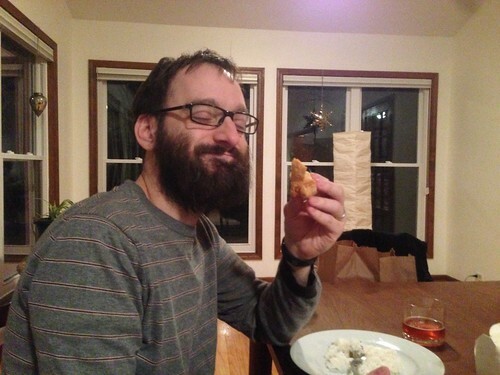 Last Saturday night we ordered Chinese take out and got crab rangoons. This may sound like a small thing but New York City and its surrounding suburbs is a cran rangoon desert. One of the more shocking moments in moving to New York City was that if you ordered crab rangoons as a Chinese joint they had no idea what you were talking about. Now, for the first time in a decade, I once again live in a rangoon-friendly environment. 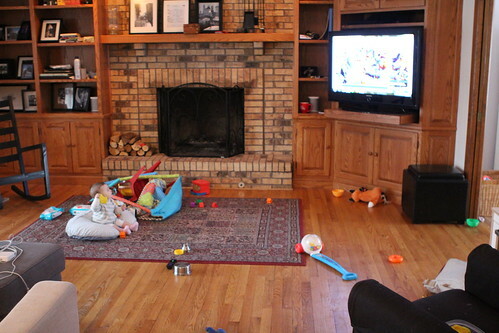 The boys are still hopelessly addicted to Elmo's World which may be the worst television program ever made. Elmo is annoying enough but if I ever see Mr. Noodle on the street I'm going to shank him. I've made good progress in weaning them off this horrible program in the last week but there is still work to be done. 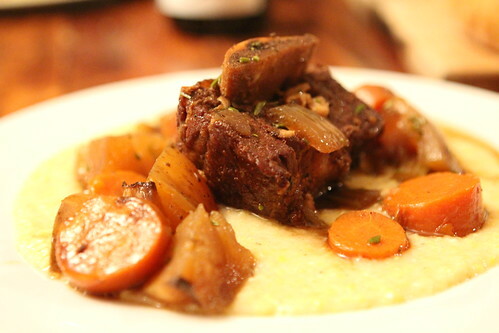 Last week I was able to make stout braised short ribs in the slow cooker. 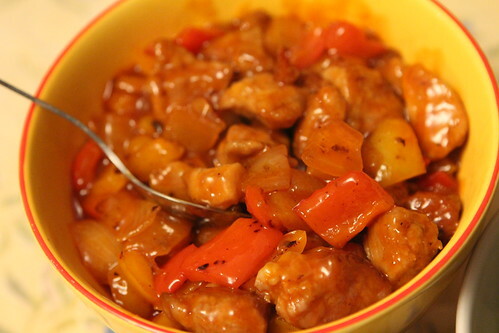 I'm still learning how to use a slow cooker and I must admit I am still very skeptical of it as a cooking device. Sadly, the time savings outweigh any moral dilemmas I have at the moment. The last three days have almost resembled a routine with Jen waking the guys up, getting them ready, have them steal snacks out of her purse, getting them to daycare, me picking them up, giving the dinner, bathing them, reading them books, and getting them to bed. Of course no routine will stand with our work schedules so this will all go out the window tomorrow. After a couple of days of fiddling I was able to somehow get the Olympics at home for viewing. 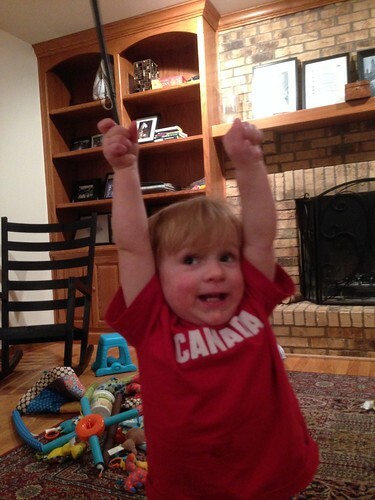 The Olympics have always been a celebrated time in our household. There is no better way to relax after dinner than by watching young people's dreams be crushed or, in rare cases, realized. 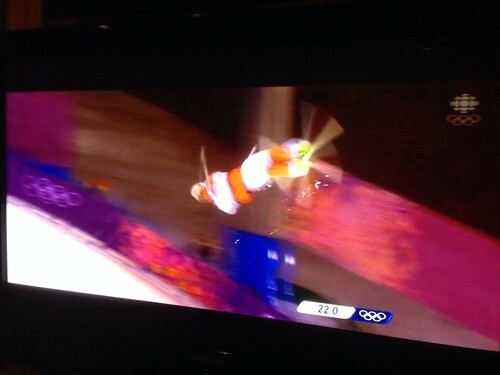 The boys were less than a month old the last time the Olympics were on. 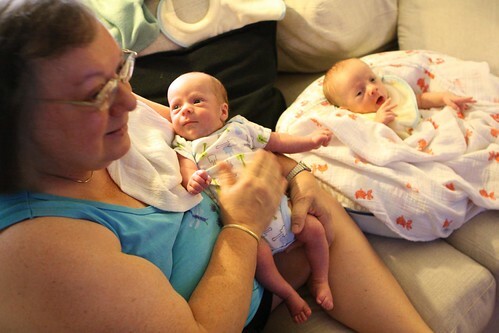 Here they are with my mother on her birthday and their one month birthday watching the Olympics together on the couch at our old apartment. Reading back on the blog it would appear that I even had some free time, time to make dinner and even write about it. We were still getting daily visitors at this point to come see the new babies. Now we're on our own with these two maniacs. 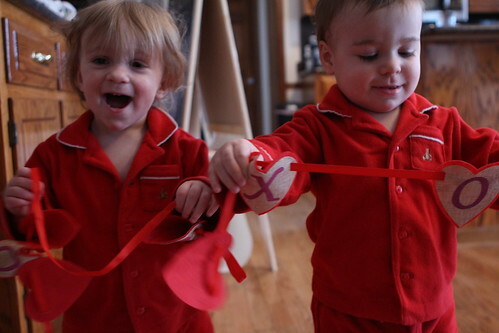 Jen had the boys do some crafting on Saturday where they were for some reason delighted by these hearts on string and found great joy in playing with them. 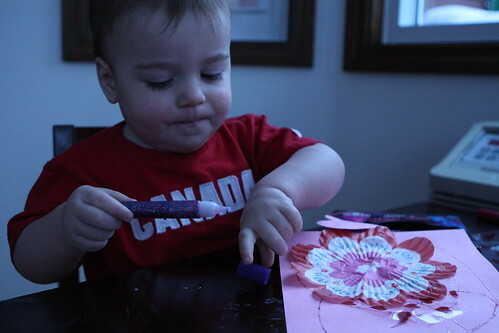 They spent some of the morning making some crafts where Elliott discovered a passion for glitter and Martin re-discovered a passion for getting bored with things quickly. When I got home they demanded I played the guitar and then, as standard practice, stole my pick (which they still think is disgusting for some reason), and then bum rushed me, covering the strings with their grubby little hands. 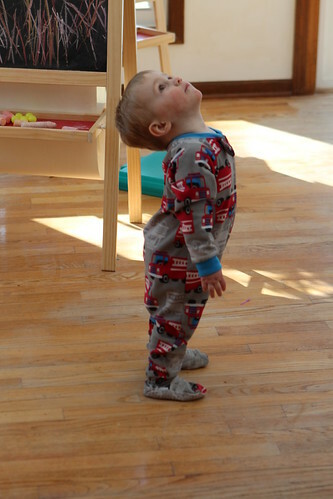 Elliott discovered how to put his hands behind his back and now thinks it's hilarious to walk around the house like this while giving us a mischievous glance. One of these days there will be a knife behind his back and we are all going to pay. Saturday culminated with joint bath time with their cousin Evelyn followed by bed, and Doug and I attempting to track cables through the attic to hook up to the antenna with no luck. Sunday was a series of failures. We attempted to take the boys swimming but the pool was unexpectedly closed. It was annyoing until they handed us a bunch of free passes so we will attempt again soon. For now we await temperatures in the 30s, about 50 degrees warmer than we've been experiencing, and the beginning of the slow trot towards spring! A Super Bowl . . . of Chili! Just when we thought Jen was out of the woods, she acquired the terrible stomach virus that we have all gotten. She was the last soldier to fall but, thankfully, had mostly recovered before her annual work trip to Salt Lake City. 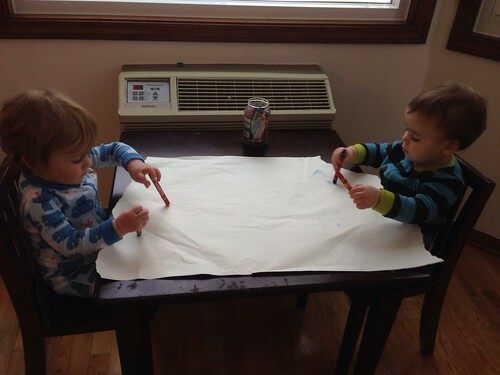 This left me alone with the two sort-of sick guys, but luckily they were just well enough to be granted acceptance into day care so that I could go about my work life. 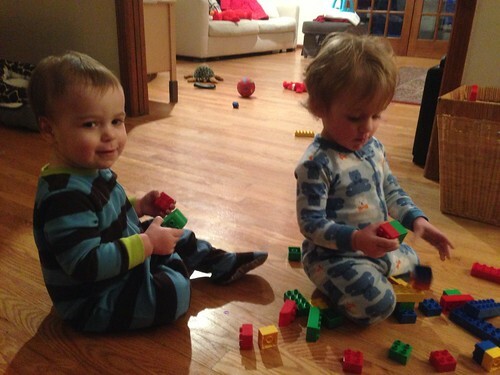 Jen's flight got cancelled because of another horrible wind and ice storm which left me with the guys for an extra day which began promptly at 5:30 AM with some pre-sunrise block-building activities. We also drew with crayons and played with numerous other toys before the sun had fully risen and well before most sane people would have woken up. Later in the day we grumpily explored the backyard in our snow gear. Then they reluctantly allowed me to pull them along on their sled. They've taken a great interest in my guitar. This means they point at it and demand I remove it from its case. Then, for some reason, Martin tries to remove my pick from my fingers and when he does, takes it over to the garbage saying, "Yuck! Yuck!" The obvious reason is that he finds my guitar playing to be lackluster and he wouldn't be incorrect in asserting that judgment. However, I don't think that's it. For some deranged, toddler-mind reason, he feels that a guitar pick is just a yucky item. He's even converted Elliott to his way of thinking. We think that Grandad has played them so many Mark Knopfler videos that they just feel that a pick is nothing more than a crutch. 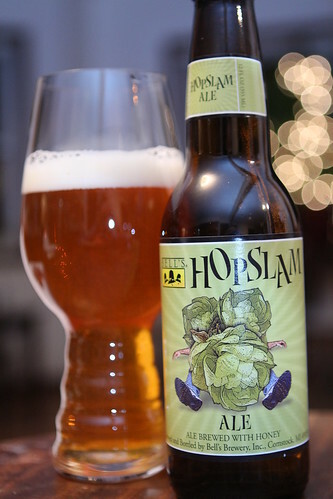 The day Jen was supposed to arrive home I managed to get my hands on some Bell's Hopslam. 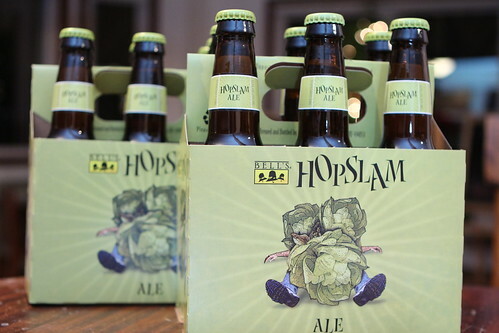 It involved showing up to the liquor store at 5pm, waiting around with a small gaggle of other insufferable beer enthusiasts, and then grabbing two six-packs off the table they were clumsily put onto. 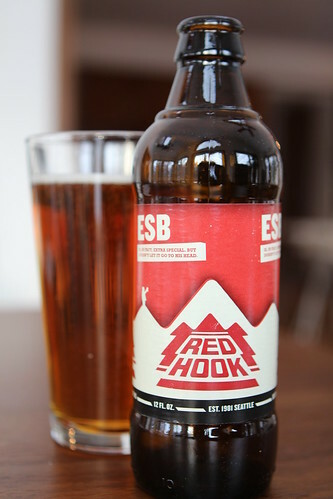 The hunt was worth it as this was one of the best beers I've had in a long, long time. We had our second Polar Vortex event of the season with temperatures around -20 degrees. On one approach to work during these temperatures I was confused as to why we seemed to have two suns all of a sudden. The temperature and scenery looked like Hoth, yet the sky looked like Tatooine. Apparently this is something that happens because of science. 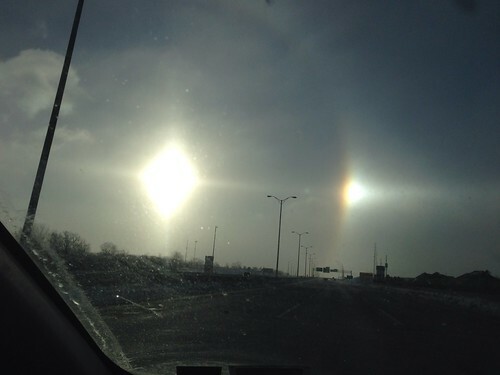 This article explains that this was actually a parhelion which happens when it's extremely cold and the sun reflects off of ice particles in the atmosphere. On Thursday, Jen was a little late, so I got the guys bathed and we played a rubber animal guessing game which they totally nailed! 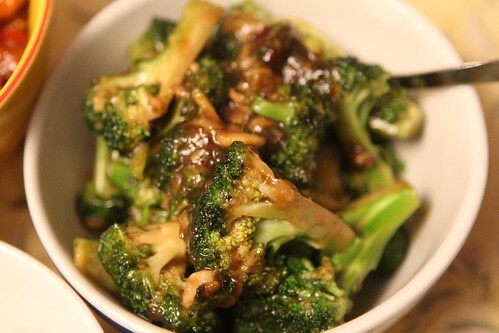 This past Friday was Chinese New Year and, despite all odds, I was able to throw together a quick Chinese New Year dinner of sweet and sour pork and Shanghai broccoli. We did this all while babysitting cousin Evelyn and getting our two rambunctious lunatic children to bed. 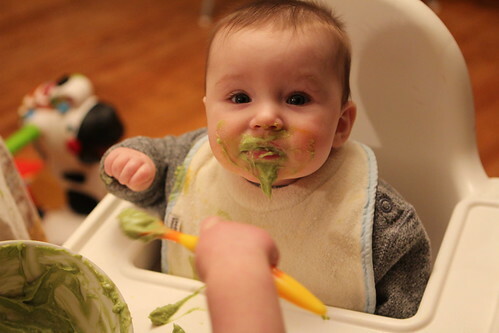 Before Lauren and Doug left for dinner they allowed Martin to feed Evelyn her avocado which is now his favorite activity. Though he may need a little work with his accuracy. 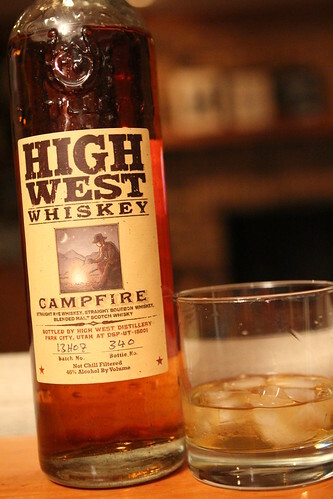 I celebrated this success with a class of this Campfire whiskey Jen brought me back from Utah. It's another bottle for my growing whiskey and bourbon collection which I will undoubtedly have to pass down to the boys some day. On Sunday Uncle Scott came to visit after playing a show in Chicago. He treated the boys to a personal drum clinic followed by lessons on their new drum set. Mostly this was a lesson in how to look like a drummer. While Elliott is technically the better drummer Martin won some style points at the end. 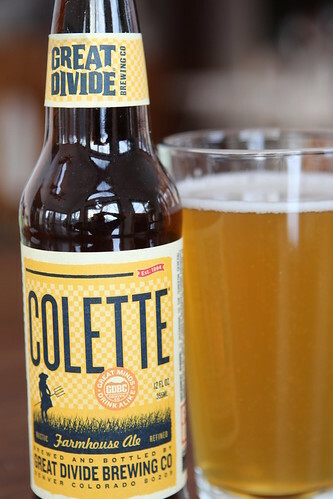 In keeping with the Super Bowl tradition of last year I served beer from Colorado and made Denver green chili to celebrate one of the Sports Ball teams that was playing. 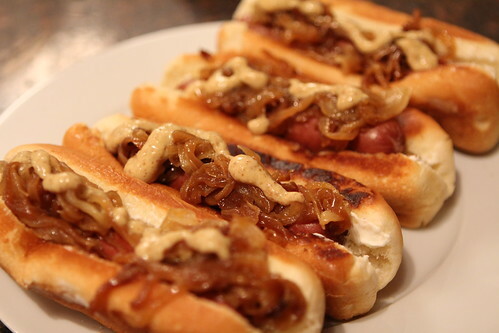 I then served beer from Seattle and made Seattle style hot dogs to celebrate the other Sports Ball team. We then proceeded to sort of pay attention to the game. I complained about how dumb halftime shows are, we were all underwhelmed by the commercials, and I accurately predicted the bigoted and racist backlash against the Coca-Cola commercial where "God Bless America" was sung in different languages.